I’m thankful for “Ordinary World” by Duran Duran. Actually, I’m thankful for any song that affects me like this one does. 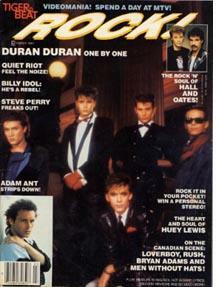 If you’ve seen my previous posts, you are aware of my appreciation of Duran Duran. But, lately it’s been more about their music than ever. And as I’ve brought together the teenager and midlifer in me, I’ve been paying more attention. When this song came out nearly 20 years ago, I was in my twenties. Although I bought the CD, I didn’t notice the song all that much. Ubiquitous radio airplay and maturity beyond my Tiger Beat perspective left me less interested in the band in general. “Ordinary World” was a ballad. I assumed it was about failed romance, and at that age this kind of song elicited a shrug and a nod, but no more. After reading John Taylor’s biography, I learned that this song was inspired by Simon LeBon’s feelings at the loss of a friend to suicide. Maybe you knew this before, but I didn’t. Listen to the lyrics. You can really feel it. And you can hear the sadness in the music. It’s textured and beautiful, and I can’t imagine it done any better. Songs like this arrest me. I’m convinced that if I am ever in a car accident caused by my own inattention, it won’t be because of my cell phone. It will be because of a song. When I hear things like this, I am cocooned from the world. I am enveloped in a silken sheet that folds me into the music. I am drowning in the song. Nothing else exists for those few moments. It’s like meditation, though my mind isn’t empty. It’s saturated. To me, Heaven would be songs like this on continuous play. I am sorry that such a gorgeous thing began from sadness. I am thankful that artists have the courage to share.